The painter and graphic artist Josef Lada was born on December 17, 1887 in the small Bohemian village Hrusice near Senohraby. Outside the Czech Republic, he is particularly known for his illustration of Jaroslav Hašek's book "The adventures of the good soldier Švejk". Lada's sketches of Švejk today are more popular than Hašek's book. After the Prague Academy of Fine Arts had rejected him and he had to interrupt his art studies, he learned drawing and painting by himself besides an apprenticeship in the craft of bookbinding. In so doing, he became acquainted with well known artists and their works like Aleš or Švabinský. Their pictures confirmed him to create own works of art. Lada had a natural talent for drawing; he was able to draw with the right and left hand. Coming from his personal experience, he transferred the life of the rural people into his works with a charming sense of humor. 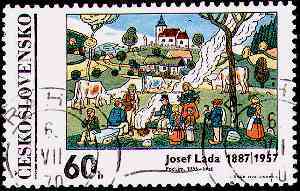 You can find his nearly naive style of painting on a set of four stamps from the year 1971, one of them the picture "Podzim" (autumn) depicted above. His style can be characterized by compact lines and broad color areas and is influenced by folkloristic elements of his Bohemian native country. He was full of emotional feelings particularly for his native town Hrusice, where he went back as often as possible. There, his artistic personality had its roots, and there, he also found a fertile soil and stimulation of his creations. One of the main themes in his works was the reminding of the childhood in Hrusice, transformed in simple paintings. In more than 15,000 drawings and 400 pictures in tempera on canvas, he almost depicted only children and old people, because for him, only these people show true emotions. And in so doing, he closed the circle of life, starting with the naive world of children and ending with the wisdom at the end of life. Josef Lada died on December 14, 1957 in Prague.